Read our Mental Health Awareness Month announcement. Nearly 60 million people in the US struggle with a mental illness. ADAA's passion and mission is about helping people living with anxiety, depression, and co-occurring disorders and their loved ones find treatment, support, and resources. We educate people about scientifically supported treatments so they can make informed decisions to best meet their individual needs. We support professionals who provide treatment and those who conduct research. We invest in the future by encouraging students and trainees. Please help us #breakthestigma associated with mental health disorders by sharing your story and supporting our work. Together we can change the narrative. Together we can change lives! 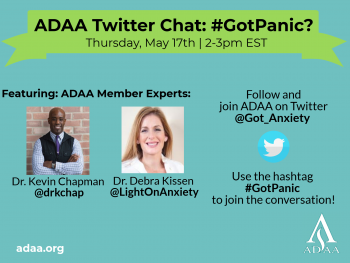 In honor of Mental Health Awareness Month, ADAA held a Twitter Chat on May 17, 2018 from 2:00-3:00 pm ET under the title: #GotPanic? ADAA member experts Dr. Kevin Chapman, PhD, and Dr. Debra Kissen, PhD, MHSA, hosted the chat which focused on symptoms, management, and treatment of panic attacks and panic disorder. Participants used the hashtag #GotPanic to follow along with the chat and ask questions.